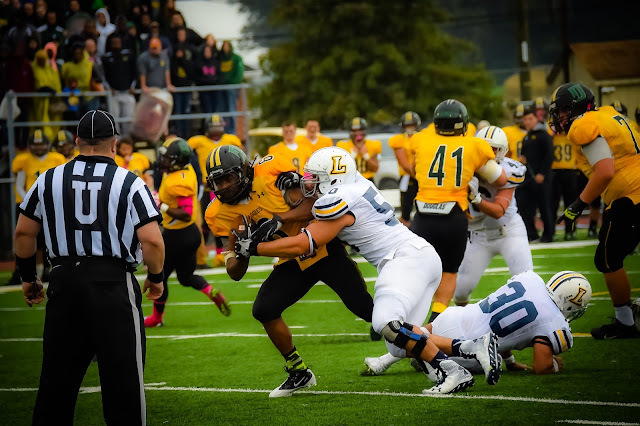 DOYLESTOWN (PA) – The Delaware Valley University football team looks for its seventh consecutive victory when it travels to Lycoming College for the final road game of the regular season. Kickoff at David Person Field for the Middle Atlantic Conference (MAC) matchup is set for 1:00 p.m. The Aggies, ranked 19th and 21st respectively in this week’s D3football.com and American Football Coaches Association Top 25 Polls, defeated Lebanon Valley College, 28-21 at home last week to up their overall record to 7-1 and remain in a three-way tie for first place in the MAC. DelVal, Albright College and Stevenson University are deadlocked at the top of the standings with identical 6-1 conference marks. However, the Aggies own the tiebreaker with head-to-head wins over both and control their own destiny. In addition, the Lions and Mustangs battle each other this week in Owings Mills, Maryland. DelVal held the Flying Dutchmen offense to 262 total yards in last week’s victory. The winning score came with 8:05 remaining in the fourth quarter when freshman quarterback Dashawn Darden (Norristown, PA/Cardinal O’Hara) found fellow first-year player Eric Shorter (Trenton, NJ/Princeton) for a 92-yard touchdown. The Aggies lead the MAC in rushing with 286.4 yards per game. That number is good for eighth in all of Division III. DelVal also ranks second in the conference in total yardage (417.1 ypg) and fifth in scoring (25.3 ppg). Sophomores Devauntay Ellis (Ewing, NJ/Ewing) and Armani Fuller-Williams (Philadelphia, PA/Mastery Charter) and junior Robert Cleveland (Willingboro, NJ/Willingboro) share the backfield duties. Ellis, a junior college transfer, paces the squad with 567 yards on 71 carries (8.0 avg) and five touchdowns. He was bottled up for 31 yards on 11 attempts against Lebanon Valley. Ellis has rushed for 100-plus yards twice this season. Cleveland led the trio with 57 yards on 10 opportunities last week. That upped his season totals to 80 rushes for 462 yards (5.8 avg) and two scores. Cleveland had a career-high 162 yards on 16 chances with two trips to the end zone at FDU-Florham on October 2. Fuller-Williams had the only score on the ground last week, a three-yard run, to go along with 25 yards on nine carries. He has amassed 402 rushing yards on 67 attempts (6.0 avg) and has reached the end zone seven times. Fuller-Williams hit the century mark with 120 yards on 11 opportunities and a touchdown at Misericordia on September 19. Darden and wideout Tyler Bing (Galloway, NJ/Absegami) have also done their fair share of damage on the ground. Darden is third on the squad with 417 yards on 59 rushes (7.1 avg) and two trips to pay dirt. He led the team with 69 yards on 11 chances last week. Bing has ran the ball 33 times for 321 yards (9.7 avg) and five touchdowns, including four times for 15 yards against the Flying Dutchmen. Darden has appeared in every game but took over the starting quarterback job in the Albright contest. He has thrown the ball 45 times, completing 24 for 383 yards and five scores. Darden was 8-of-12 last week for 186 yards and three touchdowns. Shorter and Bing have been the primary targets in the passing game. Shorter has caught 15 passes for 259 yards and the one 92-yard score. Bing has made 17 receptions for 205 yards and one trip to the end zone. Senior tight end James Norton (Hatboro, PA/Upper Moreland) has added 11 catches for 133 yards. The Aggies’ defense is second in the MAC in scoring (14.9 ppg) and rushing (106.6 ypg). Those numbers rank 22nd and 29th in the nation respectively. DelVal is fourth in the conference in total yardage (313.3 ypg). Senior safety Danny Wynne (Hatfield, PA/North Penn) continues his case for a third all-MAC selection, leading the squad with 62 tackles. He had a team-high 10 stops last week. It was the second straight game and third time this season that Wynne reached double-digit tackles. Sophomore Shawn Miller (Laurel, DE/Laurel) has totaled 52 tackles, two interceptions and one forced fumble. The safety returned one of the picks 100 yards for a score against Stevenson and was named the MAC Defensive Player of the Week after that contest. He registered six stops against Lebanon Valley. Senior linebackers Ethan Snyder (Catawissa, PA/Southern Columbia) and Rashaad Lighty (Pottstown, PA/Pottstown) have recorded 50 and 38 tackles respectively. Eight of Lighty’s stops have been for a loss, including five sacks. He also has five forced fumbles in eight games, which is tied for second in the country. Snyder and Lighty combined for 10 tackles last week. Junior lineman Luke Boonstra (Mahwah, NJ/Mahwah) had a career game last week, notching eight tackles to bring his season total to 20. With the Flying Dutchmen stationed at the DelVal 39, he recorded a sack on the final play to secure the win. Historically a perennial contender in the MAC, the Warriors are having a rare down year at 2-6 (2-5 MAC) and are guaranteed their first losing season since 2009. Lycoming will look to play spoiler against a DelVal team that it defeated, 19-16, the last time it played the Aggies at home in 2013. The Warriors dropped their last contest at Widener University, 48-7. The Warriors’ success offensively has been on the ground, as they rank third in the conference in rushing (185.3 ypg). They are led by the MAC rushing leader in junior Blake Bowman, who is nearing a 1,000-yard campaign with 928 yards on 164 carries (5.7 avg) and 12 touchdowns. He is also first in the conference in rushing touchdowns and second in scoring (9.8 ppg). Bowman recorded 74 yards last week after a 281-yard effort against FDU-Florham. Sophomore Scott Palmer is the change-of-pace back and has run the ball 70 times for 328 yards (4.7 avg) and two trips to the end zone. He rushed for 76 yards at Widener and had a 112-yard performance in the Stevenson game. Junior Chase Whiteman has started every game under center. He has completed 89 passes in 160 attempts for 1,191 yards and eight touchdowns. Last week, Whiteman was 7-of-14 for 48 yards and a score. His top target is senior Ryan Umpleby, who has hauled in 35 passes for 532 yards. He has reached pay dirt on five occasions. The Warriors are fifth in the MAC in rushing defense (135.8 ypg). Defensive backs Matt Malecki and Mike Ward lead Lycoming with 52 tackles apiece. Ward, a sophomore, also leads the team with four interceptions and has one forced fumble. Malecki, a senior, has one pick on the year. The duo combined for 11 stops last week. Senior linebacker Phil Schron III has 50 tackles, including 6.5 for a loss. He made three stops against Widener. Freshman linebacker Dominic Loffredo and junior lineman Jon Rummel have each made 33 tackles. Seven of Rummel’s stops have been for a loss, including 4.5 sacks. The two had a combined seven tackles versus the Pride.